About one in 10 adults older than 40 years of age have COPD. For these individuals dyspnea is the primary disabling symptom that limits independence and quality of life. We try to treat it with bronchodilators and inhaled glucocorticoids, but eventually the dyspnea worsens as the disease advances. We add oxygen, we try opioids, and we search for other potential causes and other potential treatments that may relieve this distressing symptom. The good news this week is that there may be one more intervention in our bag of tricks – acupuncture. Yes, the Archives of Internal Medicine just published a study from Japan that adds some evidence that acupuncture is an effective treatment for dyspnea. Now for all you skeptics out there: I realize I live in San Francisco but I swear I’m generally a skeptic as well. Complimentary and Alternative Medicine (CAM) studies are often fraught with methodological issues. This study done by a group of Japanese researchers unfroze my heart towards CAM, in part due to their interesting methods to blind participants and thoroughness in study design. The authors performed a prospective, single-blind randomized controlled trial of clinically stable outpatients with stage II, III, or IV COPD who had stage II or higher dyspnea according to the Medical Research Council (MRC) criteria (Stage II is short of breath when walking up a short hill). These were reasonably functional patients who were able to walk unassisted and apparently had no evidence of cardiovascular disease, collagen disease, renal failure, thyroid dysfunction, hepatic function disorder, cancer, and severe mental disorders (this list rules out most of my patients). The patients were randomized to either 12 weeks of a standardized acupuncture treatment group or a sham acupuncture group that used the same acupuncture points as the real acupuncture group. The authors blinded everyone in the trial but the acupuncture therapists by using a Park sham device (see picture). This device either had a real or placebo needle attached to it. 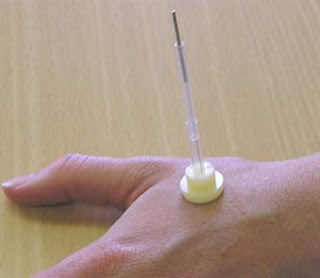 For the placebo group, the tips of the placebo needles were blunt, so even though they appeared to be penetrating the skin, they actually just telescoped back into place. At least in regards to patients, the authors attempts in blinding seemed to work, as most patients responded “don’t know” when asked at the end of the study what intervention the received. After 12 weeks of treatment the primary outcome, changes in dyspnea on exertion after a 6-minute walk test (6MWT) using a modified Borg scale (0 to 10 points), improved on average by 3.6 points in the real acupuncture group but not at all in the sham group. They also found significant improvements in the 6 minute walk distance, oxygen saturation during the 6MWT, quality of life scores, and dyspnea scores using the MRC after the 12 weeks of acupuncture. Changes in the FEV1 did not reach statistical significance, although after 12 weeks of acupuncture, there were significant improvements in the real acupuncture group in regards to respiratory function (forced vital capacity, percentage of FEV1, DLCO, and percentage of DLCO) and respiratory muscle strength (maximum expiratory mouth pressure and maximum inspiratory mouth pressure). What to do with this study? This is the first study of it’s kind to show that acupuncture improves dyspnea on exertion and exercise tolerance in patients with COPD. It is a small study of only 68 patients in a relatively homogenous Japanese population, so generalizability is an issue. It is difficult to know whether the results of this type of acupuncture can be generalized to other types of acupuncture that a patient would get if he/she were sent to a therapist. Lastly, it is also plausible that the unblended therapist in this trial may still have influenced the results of the study, even though all the evaluators were blinded. In the end though, the harms of acupuncture are small and the potential benefits are significant considering the morbidity that is associated with dyspnea. There still needs to be a bigger trial using similar rigorous research methods to confirm these findings, but I think I'm going to stick this in my bag of goodies next time I'm searching for a way to treat dyspnea in COPD. You might have to turn your skeptic card in, Eric! This is a biologically implausible intervention. The classical theory is that there exists (an unmeasurable and unobservable) vital force and that it can be manipulated by a mechanical, physical intervention. There are even competing alternate views about the distibution of this (unmeasurable and unobservable) vital force. Let this sink in. This is not a scientific question, thus the tools for scientific inquiry are not appropriate to judge it. In a way, assertions about manipulation of Qi cannot even be said to have truth states. They are contentless. 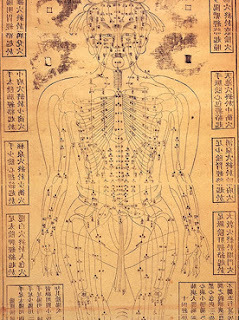 If you strip away the metaphysical elements, you are left with the assertion that insertion of needles into arbitrarily designated parts of the body will help with problems in other areas of the body. This IS a scientifically testable hypothesis. With no plausible biological mechanism in play, what a priori probability should one assign to the hypothesis that acupuncture reduces dyspnea? If your a priori probability is within a couple of orders of magnitude of mine, then an RCT done to a p-value of 0.05 is never going to be very interesting. The chances of random noise remain much, much higher. So do the probabilities of accidental bias or of intentional fraud (which has been a problem for acupuncture in the past). I'm not as concerned with biologic plausibility as Bruce. Whether it is endorphins, the placebo effect,'qi energetics', or something else that we just don't understand, acupuncture does seem to help some people with symptom management with limited harms/SE, which can only be a boon in HPM. Allowing that there was no intentional fraud, the question of whether the clever placebo arm was really appropriate does remain. This study aside, traditional acupuncture visits tend to involve an extended consultation with elicitation of symptoms and life issues which direct the individualized treatment that follows. I think that's what many patients want from us too. Perhaps that is also a significant contributor to the therapeutic benefit. ---Instant relief for sciatica and chronic back pain guaranteed! Simple, Effective, Life Changing! Generally we do not have any type of information and we do not know about some disease but now a days there are lots of information provide on internet. I read this your details about COPD with acupuncture treatment. Thank you so much to share this important information with me.